The NTI VOPEX� VOPEX-C5SVA-16 S-Video and Audio Splitter/Extender simultaneously displays high-resolution video from one computer source to 16 remote locations via Cat5 UTP cable. The VOPEX-C5SVA-16 is a real-time system which supports remote s-video devices up to 600 feet from the computer as well as local display. 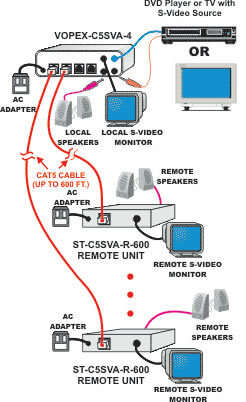 The VOPEX S-Video Splitter/Extender system has two components: the VOPEX-C5SVA-16 S-Video broadcast unit, which connects to the host computer and also supplies video to a local monitor, and an XTENDEX ST-C5SVA-R-600 remote unit (sold separately) for each remote monitor. The units are interconnected by CAT5 cable.